News broke this evening that the Government will be carpet bombing homes in Britain with a leaflet explaining how 'remaining in the European Union is best for the UK'. This comes at a cost of £9.3m to the taxpayer and represents a bid on the part of the Government to significantly skew the referendum in their favour. Given that the Government contains several ministers who in fact believe the exact opposite, it is already a misrepresentation of the facts. Inside it goes further, even perpetuating the long since debunked '3 million jobs rely on our EU membership' myth. 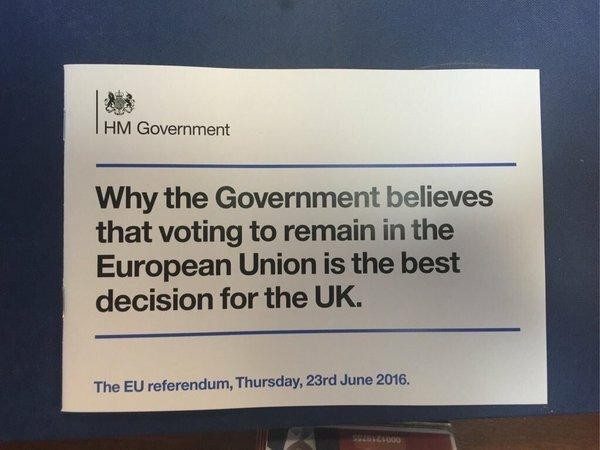 What's more is that the issuing of this leaflet reneges on promises made by the Government itself. Minister for Europe David Lidington is on record as saying in September of last year that the government has: "...no intention of legislating to allow the Government to do things such as mailshots, paid advertising or leafleting." I don't blame people for wanting more information before making up their minds on this issue. The level of debate on both sides has been absolutely woeful. This intervention from the Government however is merely an extension of the Remain campaign and whilst it may not technically break the law, it is certainly highly questionable ethically and an affront to democracy. The information people need is readily available, it just needs a little bit of work and half an hour or so on Google to find. It is an important issue, and people should seek to gather as much information as they possibly can before deciding. This leaflet though is pure propaganda, disgustingly paid for by the taxpayer.